No pocket guns such as Keltec PF9, Ruger LCP etc. You will be presenting the gun from concealment and re-holstering repeatedly. 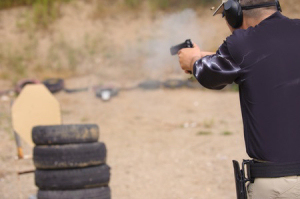 You need to be proficient at this task and have a holster that does not collapse when the gun is removed.